Glitter on her eyelids, a full-length silver fox coat, and towering patent peep-toes. This look might seem aggressive for a morning commute, but consider this: Honi (pronounced “honey”) Harlow had just gotten off work. At 10:30 in the morning, Harlow had left her gig as a host and producer at Nurse Bettie, a burlesque bar on Norfolk Street, not to head to home bed, but rather to rehearsal at Duane Park, the swanky Tribeca restaurant and club where she sings. While she did seem a bit tired (and who could blame her? 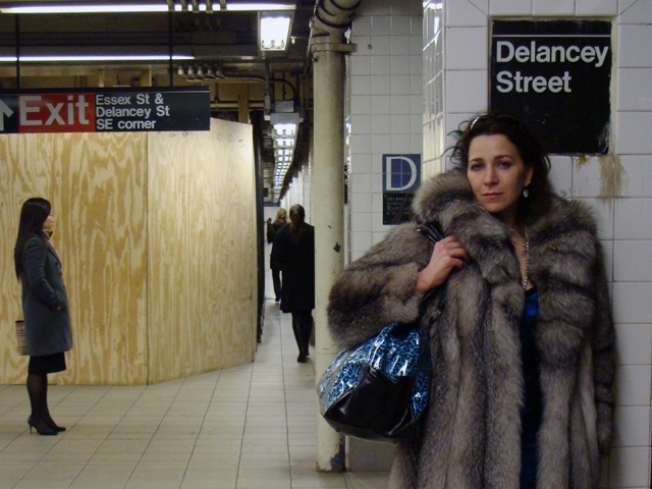 ), she said her vintage full-length fur coat was helping her rally. Her cousin had given it to her, she said, “as a divorce present, to help me through the rough times.” We wish her the best of luck, but hardly imagine she needs it if she's this hardworking.